Visual Studio Code>Other>Git Extensions for VS CodeNew to Visual Studio Code? Get it now. Provide a command to browse the current project using GitExtensions, from the Explorer. This extension provides a command to browse the current project using GitExtensions, from the Explorer. From the Explorer, when you right-click (anywhere; a file or not) and then select the Browse with Git Extensions, Git Extensions will open in Browse mode for your current project. There are no settings at this point. Added support for workspace; the right-clicked context menu item is now taken into consideration, opening GitExt based on that file or directory. Moved the Browse with Git Extensions option up, right under the navigation section. Added the Browse with Git Extensions command to the context menu of the editor, allowing to open GitExt from an opened file. Update the vscode dependency to ^1.1.22 to remove the event-stream vulnerability. 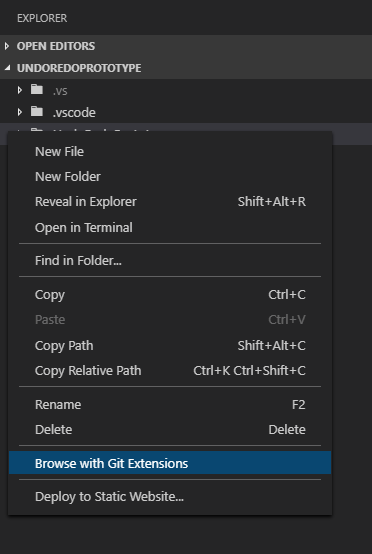 The initial release of Git Extensions for VS Code, it contributes the Browse with Git Extensions command to the explorer's context menu.